Do you know what happened in your family generations ago? Do you have your very own genealogy tale to tell? Every lifetime is created out of special stories. Even the smallest of coincidences can trigger an avalanche of events and change. Our genealogy mystery novels and articles, feature amazing accomplishments of people who created special lifetimes and changed the world for the better, perhaps without even realizing it at the time. In Bloodlines -Traces we describe the heroic journey of Keith Murdoch, who saved the lives of many soldiers in WWI, by smuggling out a letter to prime minister Asquith, who then put an end to the atrocious killings in Gallipoli. This is the same Murdoch who would later become the father of newspaper mogul Rupert Murdoch. These are famous stories of famous people. We also want to hear about the feats of the ancestors that changed the shape of your life. Just think about how daunting it must have been for our ancestors of the 19th century to emigrate to the America’s. Apart from the few daring explorers, people often never ventured out of their place of birth for more than 20 miles. Imagine the culture shock in a time when humanity still depended on storytelling and rumor had it the streets in America were paved with gold. When there was no television, no movies, nor hardly any books, let alone travel guides, to give samples of different countries and cultures. We invite you to share your story, the events and discoveries that made a change. 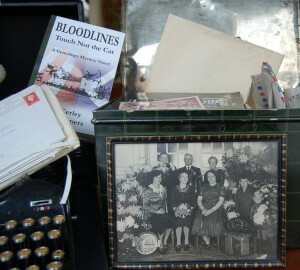 Courageous undertakings in the lives of your ancestors or those of whom you feel they deserve a place in the spotlight. exclusively written in mutual agreement and only published with mutual consent. Do you want receive our blog by e-mail? No longer wish to receive our blogs? Click this contact link or send a mail to info@touchnotthecat.com and we’ll unsubscribe your address. We vow to only use your address for the purpose of sending you news related to the Bloodlines Series and will not give or sell this information to others.